Sell with Us News Directory Accessories About Us Item Sold? Now on display at Teesside Caravans the BRAND NEW BAILEY PEGASUS GRANDE! Holidays are all about exploring the wide-open spaces and the new Pegasus Grande, with an 8ft wide body, gives you more space all round. Creating a feel of comfort that the whole family will love, the Pegasus Grande gives more space and more choice, with the best of both worlds in terms of touring and being able to explore, wherever you choose to holiday. Now in at Teesside Caravans, the all-new Pegasus Grande includes a choice of six different layouts, including two twin-axle island bed options (Bologna and Messina), two-twin axle family layouts (Turin and Palermo), and two single-axle models (Brindisi and Rimini). All models include a number of key specification upgrades as well as some unique aesthetic enhancements. Making you safe and secure on the road, exterior features include the AL-KO ATC Trailer Control System as standard, AL-KO AKS 3004 Stabiliser and ALKO Secure receivers fitted to twin-axle models. For further piece of mind the addition of the TRACKER Retrieve stolen vehicle recovery system (with three months free subscription included) is fitted to all models. With its signature GRP skinned polar white body shell panels, the new 8ft wide Pegasus Grande is perfectly complimented by the bespoke blue and chrome co-ordinating graphics scheme, aerodynamically profiled double glazed Polyplastic flush-fit windows throughout and the striking ‘room with a view’ vertical front window to ensure it stands out from the crowd. As with all Bailey leisure vehicles, models are built using our patented Alu-Tech construction technology, cloaked in a GRP outer skin, making them more robust, more durable and yet lighter than those manufactured using conventional methods to offer greater protection against the elements to keep you comfortable, safe and secure all year round. To date approaching 50,000 Bailey leisure vehicles have been built with this ground-breaking technology and are currently being used around the world. Inside the striking new look is beautifully showcased by the spacious interiors. With up to 25% additional interior space, the unique layouts feature either the new G-shaped front lounge with sliding front dinette table (model specific) or new central U-shaped central dinette area, with sliding table (model specific). The perfect choice for people looking for more space, it is clear that these special caravans possess a host of features, which will make your time away in them as relaxing as possible, as you explore your surroundings. In a choice of either the standard ‘Kempton’ or optional ‘Archway’ soft furnishings, the fresh interior look is enhanced with the new ‘Eucalyptus’ furniture finish, which combines perfectly with the dual finish Italian design overhead locker doors with ‘Brushed Champagne’ contrasting stripe to create a dynamic new look. The combination of the ‘Nordic Stone’ kitchen and worktop laminates, ‘Soft Truffle’ loose fit drop in carpets and new ambient over locker LED lighting creates a luxurious feel throughout. Designed with you in mind, the new Pegasus Grande includes a host of clever touches to make your holidays easier. All vehicles are fitted with a Truma 100 watt solar panel for those off-grid holidays, while feature kitchens offer greater worktop space thanks to the new drop down worktop hob cover. Attention to detail is highlighted by practical touches, such as, up to four new USB sockets in directional spotlights for smartphones and tablets and up to six ‘Piano Black’ 230v sockets to ensure everybody remains powered up. Whilst the inclusion of both a Status 550 television aerial, branded Radio/CD/MP3 player and branded dual cone stereo speakers will cater for all your entertainment needs. All models are fitted with a Truma Combi 6 (twin-axle models) or Truma Combi 4 (single-axle models) heating system to allow you to holiday no matter what time of year it is. This combined with the market-leading thermal characteristics of the Alu-Tech body shell makes the Pegasus Grande a genuine all-weather vehicle, a fact confirmed with the achievement of the highest rating for thermal performance (Grade III Classification of EN1656-I) in rigorous cold chamber testing. 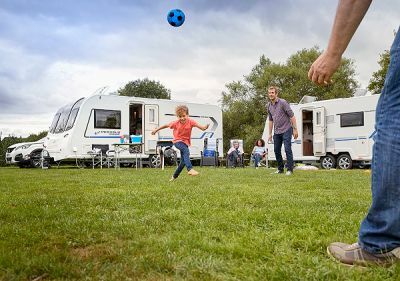 For people seeking that extra level of flexibility the Truma iNet upgrade is available to allow remote control of the caravan’s hot water and heating systems. Fully equipped kitchens feature quality appliances, such as a Thetford Caprice combined oven, grill and hob, 800-watt microwave and large capacity Dometic 145 litre tower refrigerator*. Well-designed washrooms feature large fully lined square shower cubicle and bi-fold door, Ecocamel showerhead and new full width washroom mirror (model specific). With more space and more choices, enjoy your holiday, your way. *Twin axle models only. Single axle layout is supplied with Dometic 103 litre refrigerator.